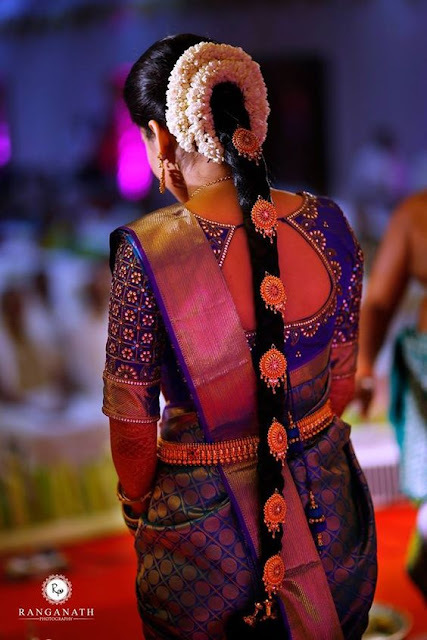 Tamil weddings are colorful with Kanchipuram silk saree, gold jewelry, braided hairstyle, and flowers. 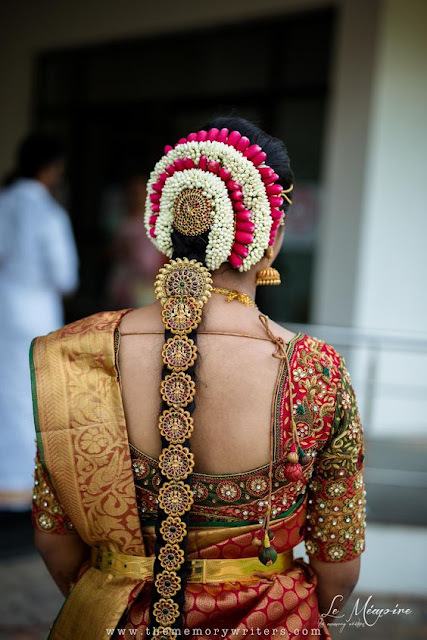 In Tamil Hindu marriages, bride's hair is braided and decorated with flowers, villai, veni, beads, and jadai. Gone are the days when heavy flower pre-stitched jadai used to be fashion. Jadai made with materials like flowers, beads, gold, pearls and silver are in trend now. 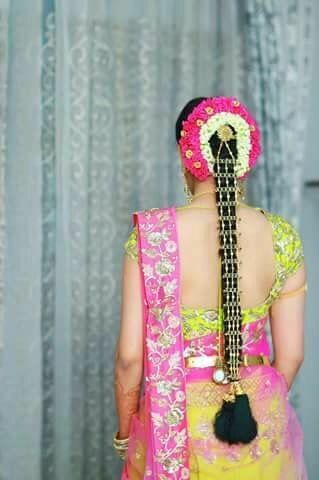 For brides with short hair, braids are made with the help of hair extensions which look as good as real hair. 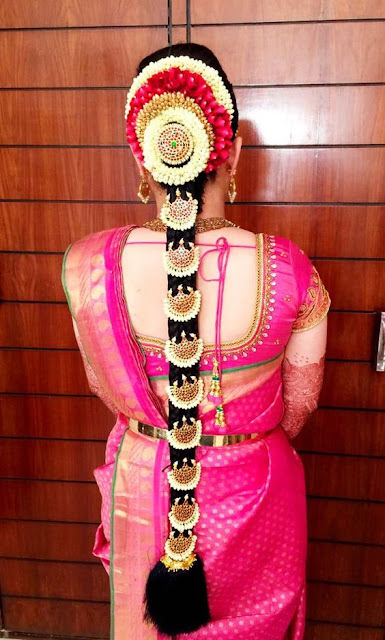 At the end of the braided hair, jadai kunjal is added to complete the bridal look. I have sorted down 10 Best Hairstyles for Tamil wedding. You can use this hairstyles as an inspiration to create your unique jadai decoration. 1. This is a simple but elegant hairstyle decoration. 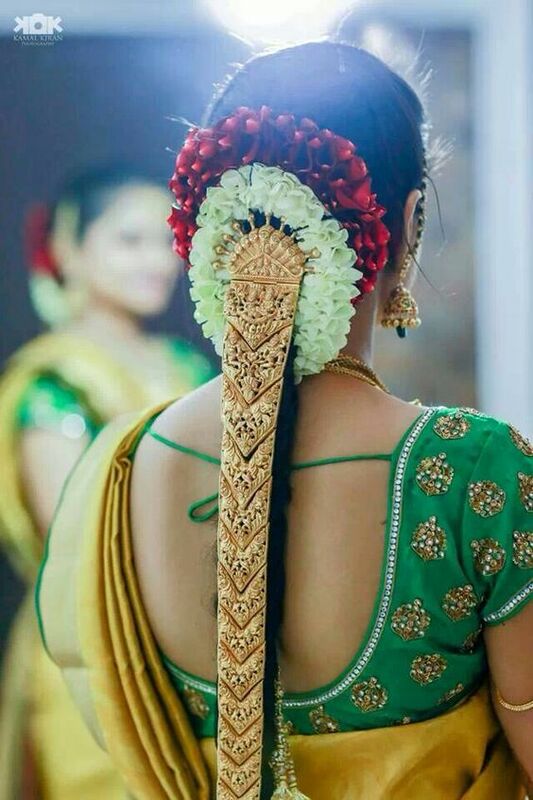 In this Jasmine Veni and Gold jadai hairpins with red and white stones are worn. 2. Antique finish jadai clips are decorated with red and white flowers to match the bride's saree, along with red and gold veni. 3. 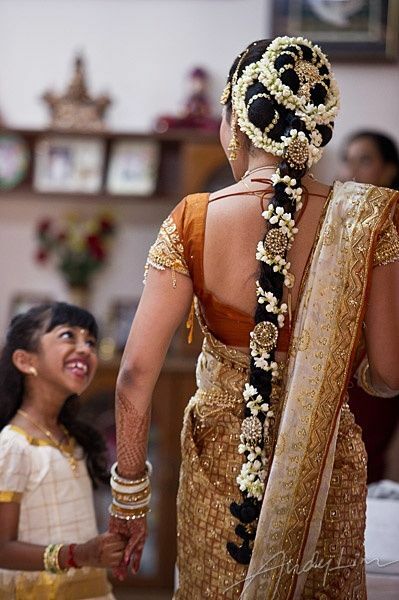 Yellow color flowers are used to make the veni, matching bride's saree color. Antique Naga jadai is worn along with pearl kunjalam. 4. 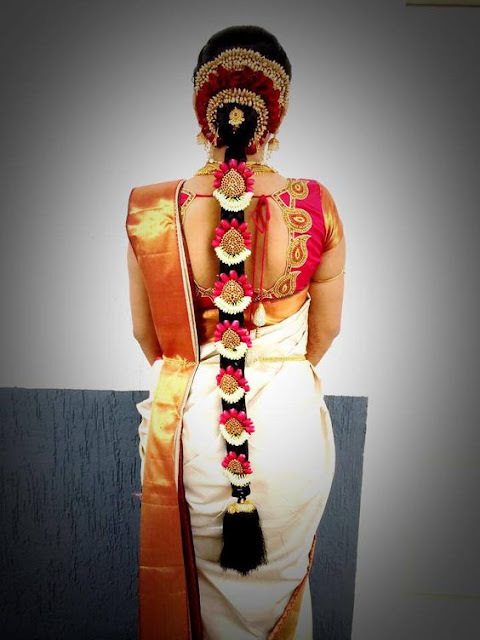 Red and white flowers are used in hair veni to create a contrast hair decoration along with gold kemp hair jadai. 5. This is a new version of poo/flower jadai. Usually, jasmine and rose flowers are used to make these type of jadai. 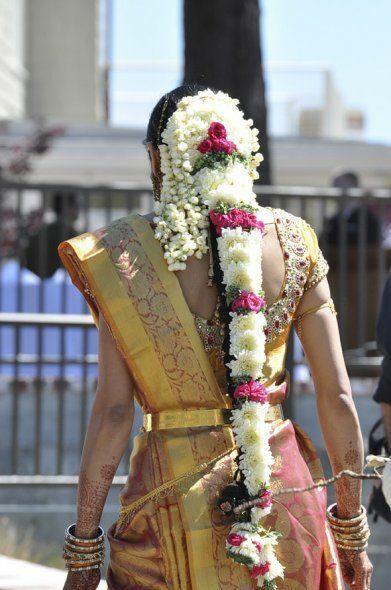 The bride is wearing flower jadai made with chrysanthemum and red roses. Florist makes flower jadai, and it comes in a pre-stitched fashion. 6. This hair style is my personal favorite among all these. In this, the hair is decorated with gold and red petal veni. 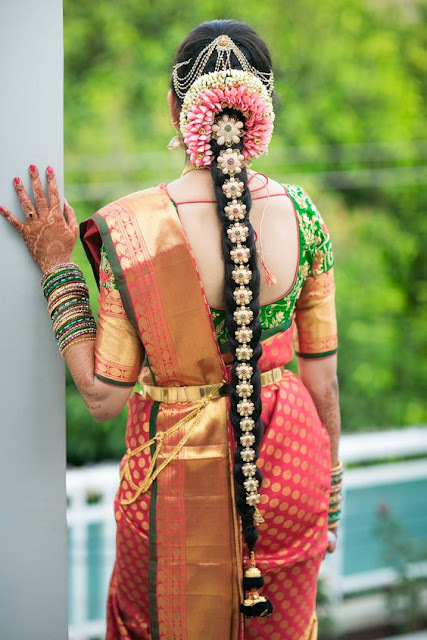 The braid is adorned with antique naga jadai, which matches her saree. 7. Netted gold jadai is a modern version of jadai. Pink and white veni have been used to complement the saree. 8. Two layers of red and white veni are kept, along with antique flower shaped jadai. This hairstyle has done justice to the beautiful saree and the stone embellished blouse. 9. Veni made with beads, and white stone studded jadai perfectly goes with the white and bronze color saree of the bride. 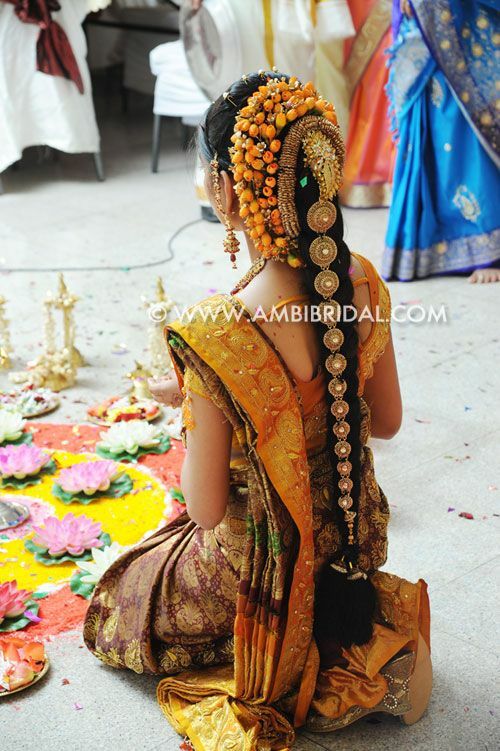 Jasmine flowers wrapped around the jadai enhances the beauty of this hairstyle. 10. 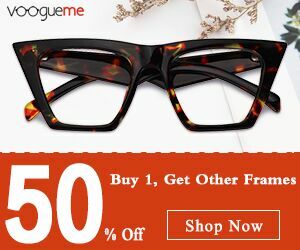 If you are opting for temple type jewelry collection for the wedding, it is better to go for gold multicolored jadai pins which would enrich the beauty of the temple jewelry set. Follow me on Pintrest for more such fashion updates. If you are a bride on a shopping spree, check out "Top 2 places to buy silk saree in Kanchipuram" and " Top 4 Places to buy gold in Chennai"